State Route 89 Pedestrian/Bike Mousehole project. 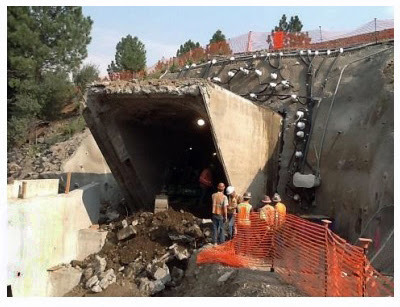 The State Route 89 Undercrossing Improvement Project (Mousehole) is now a complete tunnel structure under the Union Pacific railroad embankment. The finished project will provide safe passage for pedestrians and bicycles along State Route 89 under the tracks. The square shaped tunnel structure was built on the south side of the embankment. The structure was then jacked through a hole as a “road header” machine bore through the embankment. The embankment was frozen with cooling rods to prevent tunnel collapse during the process. 900 cubic yards of rock and soil were removed to get the tunnel structure in place. The tunnel structure broke through the north wall of the embankment on September 14, 2015. Finish work on the $14 million dollar tunnel will continue over the “next few months”.